George Alexander Maginnis was the son of Edward and Matilda Maginnis. He was born about 1911. George attended the Royal School, Armagh. He played rugby for Ulster. George Maginnis was commissioned on 6 September 1941. 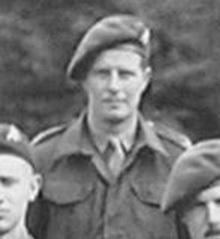 Lieutenant George Alexander Maginnis was serving with the 1st (Airborne) Battalion of the Royal Ulster Rifles when he was killed in action when he was hit by shrapnel and died almost immediately. George was the uncle of Ken Maginnis, the Northern Irish politician.